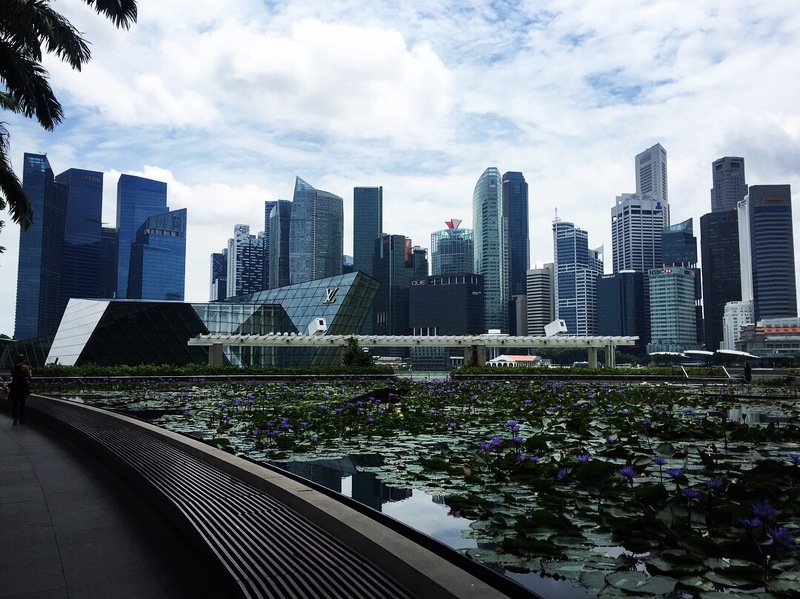 Singapore was our first stop in Asia and was a perfect transition between a western country such as Australia and what will end up being a less developed South East Asia. On Thursday 12th October 2017, we took a five hour flight from Perth and arrived in the afternoon to a very welcome hot and humid Singapore. Our hostel (The Inn Crowd) was in an area called Little India which was known for bustling market stalls and cheap, tasty food. On our first evening we headed down the road to the Tekka Market. The amount of choice for what to have for tea made it almost too hard to make a decision but in the end we opted for curries, mine with paneer (an Indian cheese) and Niall’s with chicken. Both were really good but very very spicy – particularly as neither of us are particularly brilliant when it comes to spicy food! By the end of eating them our mouths were on fire, luckily, Niall bought a banana milkshake that had magical healing powers to put out the burning in our mouths (as well as tasting good)! 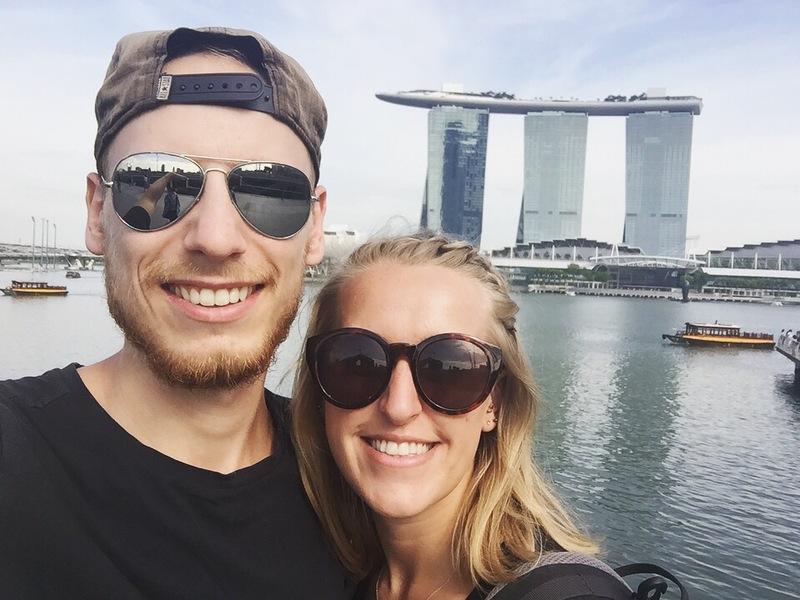 We were both stuffed and had had really good meals for our first night in Asia especially after hardly eating out or buying much of a variety of food in Australia! Deepavali (another name for Diwali) was to be held in a weeks time (18th October) and Little India was in full swing with their preparations. 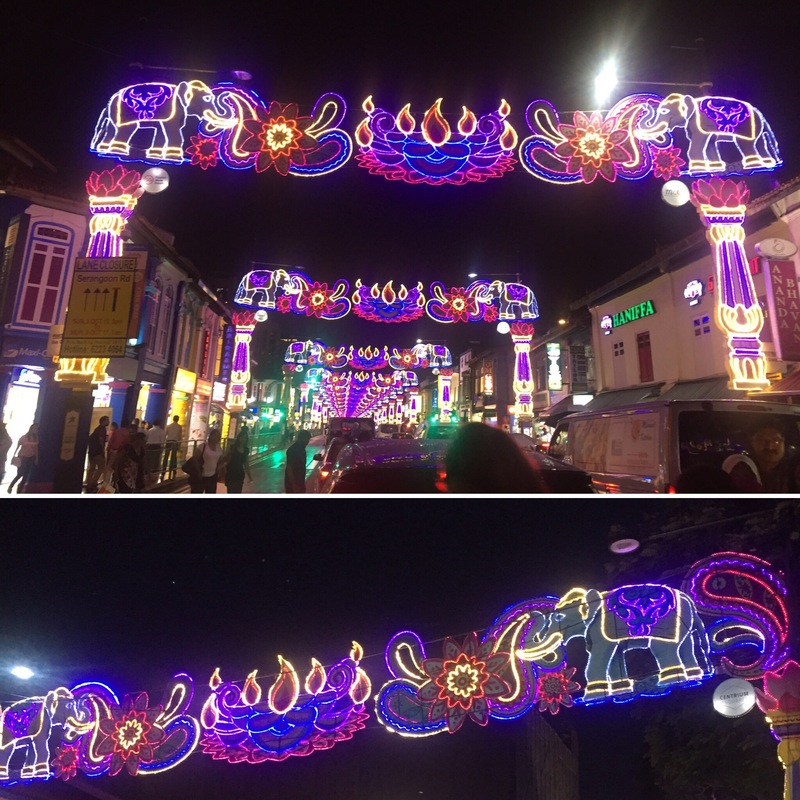 The streets were lit up with lights hanging over the roads and streets and there was a Deepavali market on which was nothing like anything I have seen before. 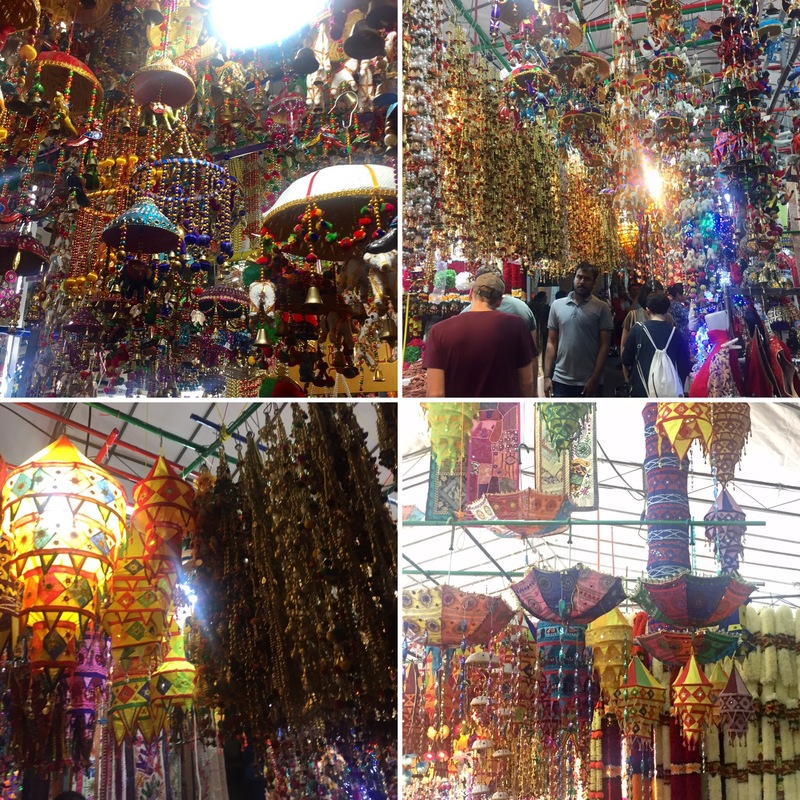 The market was a mass of lights, gold, flowers and hanging lanterns and ornaments. This was all along a narrow passageway and things were hanging so low that they brushed the top of your head! I absolutely loved walking through the market and found the place truly incredible. 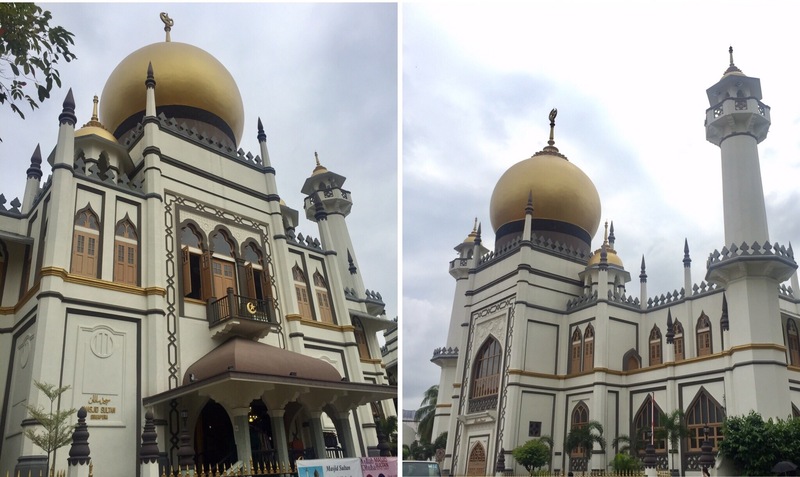 We started our first full day by going into the Muslim district which is called Kampong Glam to see the Sultan Mosque. It’s a very pretty building with grand gold domed roofs and cream walls. The area itself was also very pretty with colourful buildings and windows with shutters on them making it look like something out of an old movie – you could really see the colonial influences here! We weren’t able to go into the mosque at the time we visited as they only have specified times of entry each day but we didn’t mind, we were happy to see it from the outside. The rest of our tourist ‘to-dos’ involved us heading into the heart of the city. 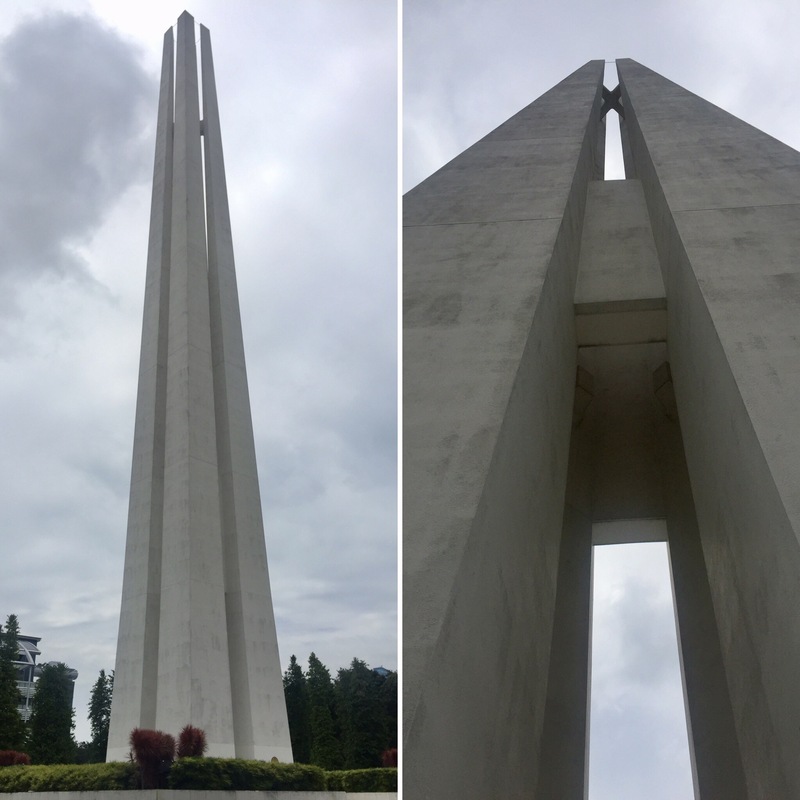 We passed the civilian war memorial, also known as ‘the four chopsticks’ which was built to commemorate the loss of lives during the Japanese occupation of Singapore between 1942 and 1945. 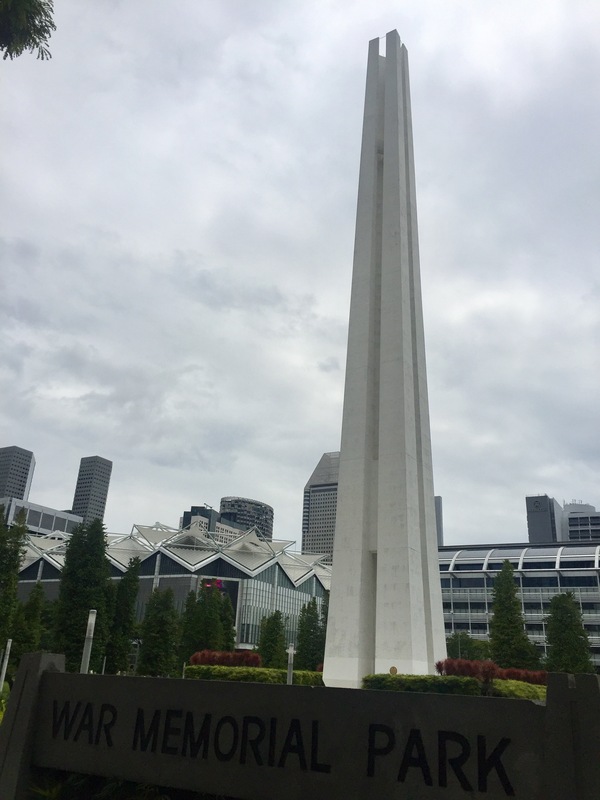 Each pillar is 67 metres high and signifies the Singaporeans, Malays, Indians and Eurasians who died during this time and are joined at the base to show unity between all races. Knowing the meaning behind this makes it a very powerful monument. I think monuments such as this one are so important for teaching and reminding us of these events in history in the hope that future generations can stop history from repeating itself. 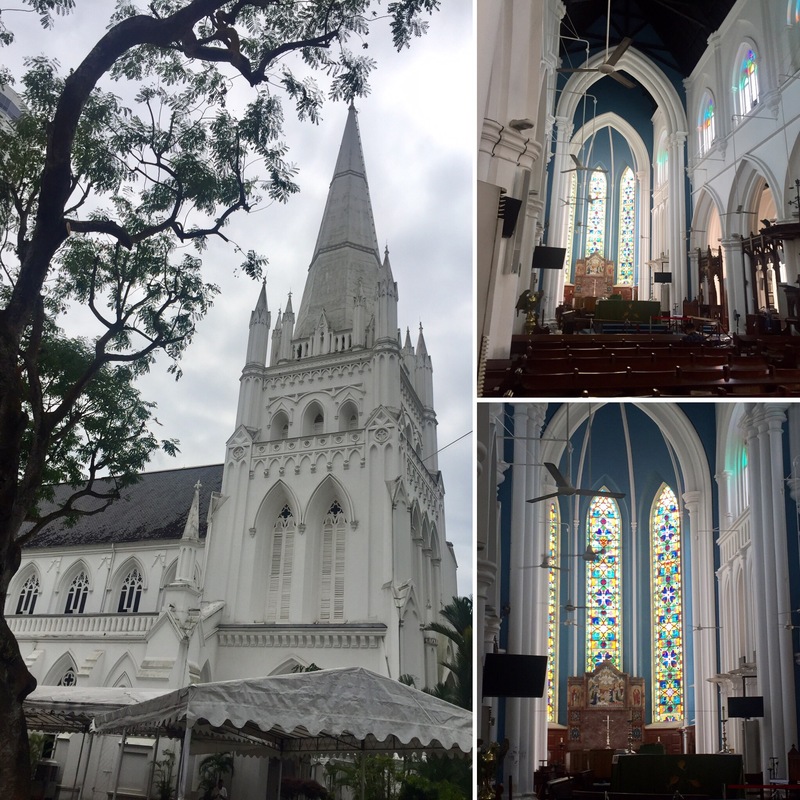 Our next stop along the route that would eventually lead us to Marina Bay Sands and the Gardens by the Bay (arguably the two most iconic sights in Singapore) was to St Andrew’s Cathedral. This is a bright white cathedral which stands in the middle of a gated grassy area. Whilst we were there we spoke to a lovely old Singaporean lady who told us of her travels to the UK and wished us a great time in Singapore. She was very sweet and it brightened up our day that little bit more to talk to her – people were all incredibly nice to us in Singapore. 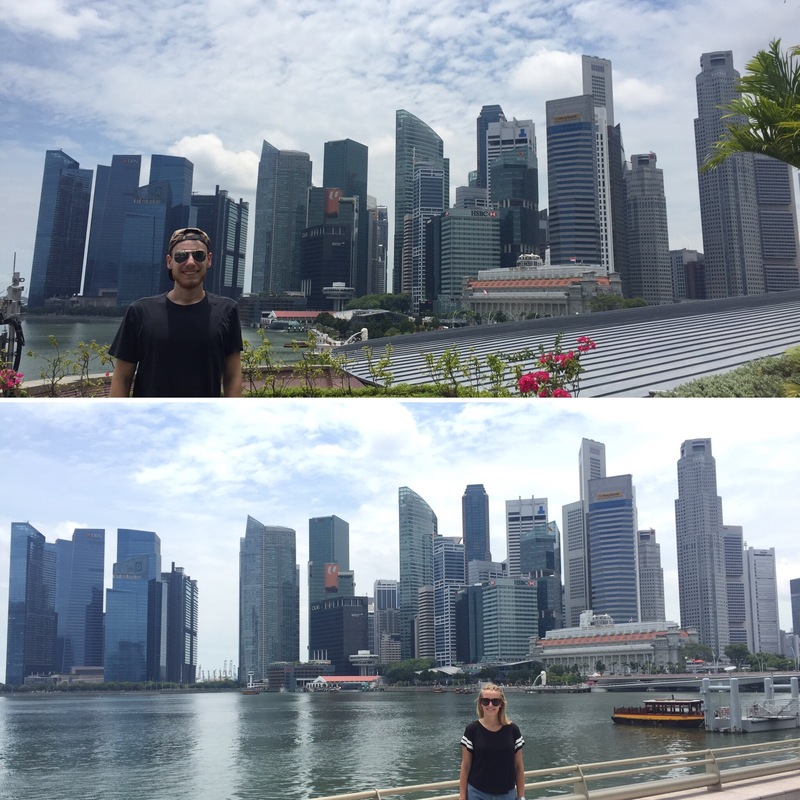 We walked along the Esplanade, which is by the waters edge and into the Theatres by the Bay. This is a labyrinth of floors, theatre rooms, exhibitions and seating areas. 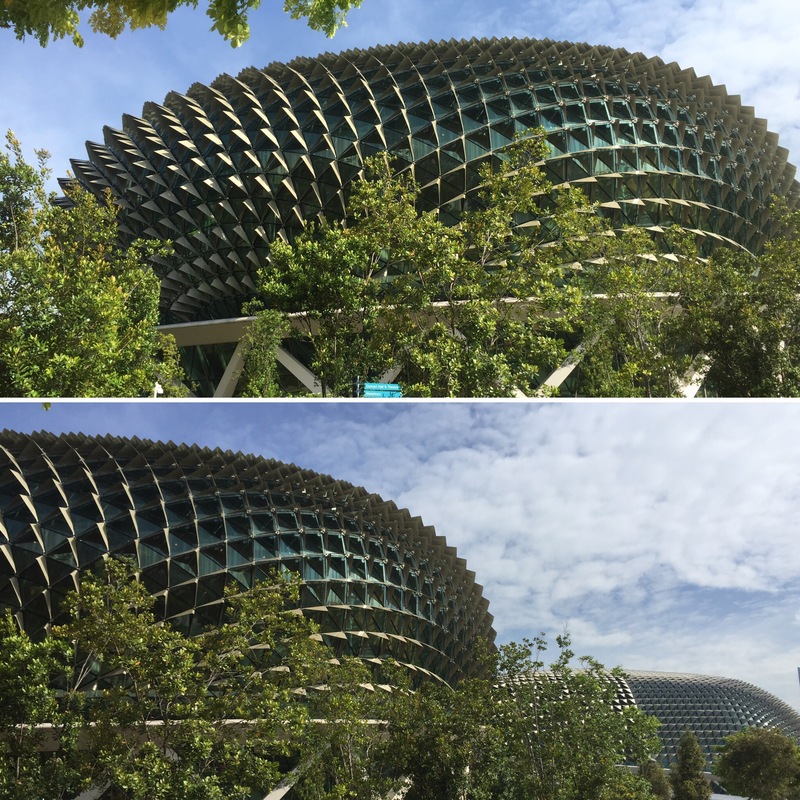 This enormous building is often nicknamed ‘the Durian’ as its spiky shape looks like the famous, smelly fruit that they have in Asia.Singapore is full of shopping malls which is a great way to escape the heat and humidity as they’re all air-conned to very cold temperatures. 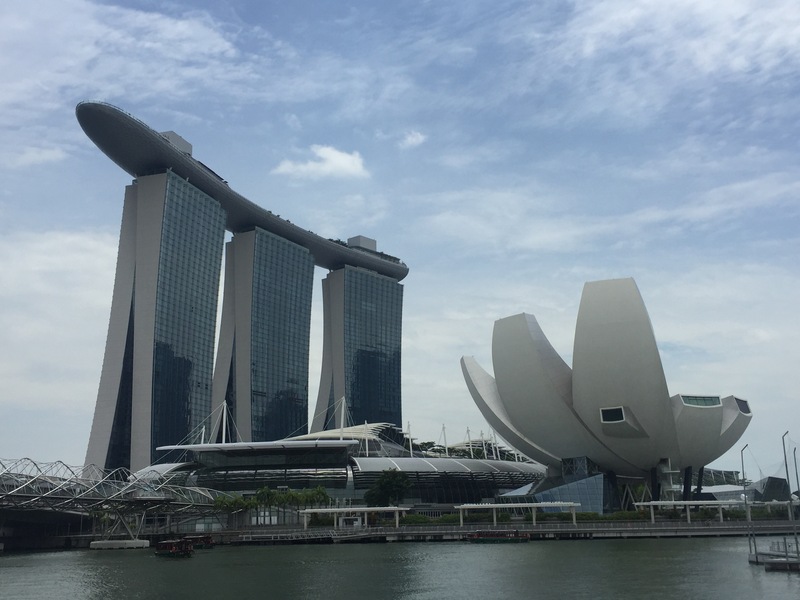 At Marina Bay Sands there is an enormous shopping centre that houses the most designer brands in the world, celebrity restaurants and an indoor river with gondola’s. Marina Bay Sands itself are three towers that make up a very fancy hotel which is connected to the shopping centre to provide easy access for the rich to offload their cash! 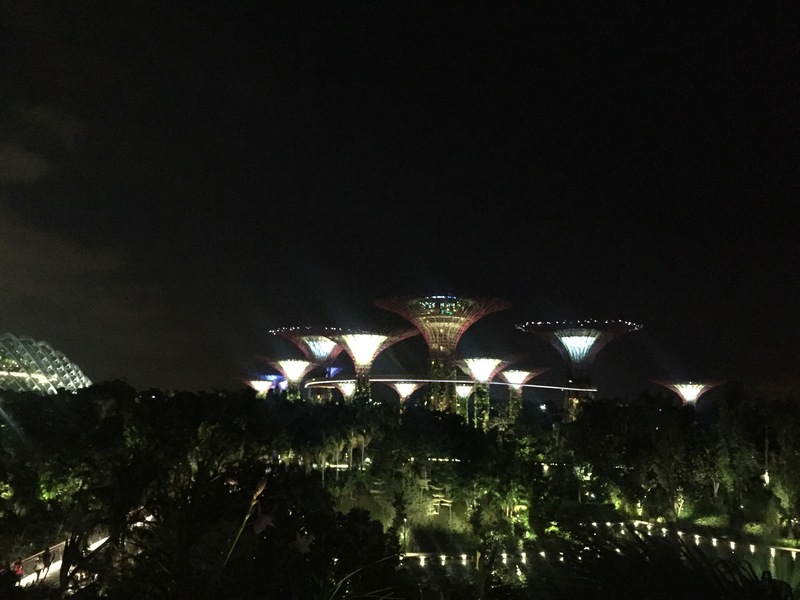 This place is an iconic part of the skyline in Singapore and has what looks like a giant ship on top of the towers which has a bar and an infinity pool which only the guests of the hotel can use. We didn’t go up there as you needed to pay entry but the views are meant to be amazing. Outside the shopping centre gives fantastic views of the city skyline and it also has a lovely pond which was full of flowering lily pads. We spent a lot of the day walking around the city, taking in the river views and sitting in various spots of shade. We headed along the river to Merion Park which is a small courtyard that looks onto a big water fountain that’s half lion, half fish. 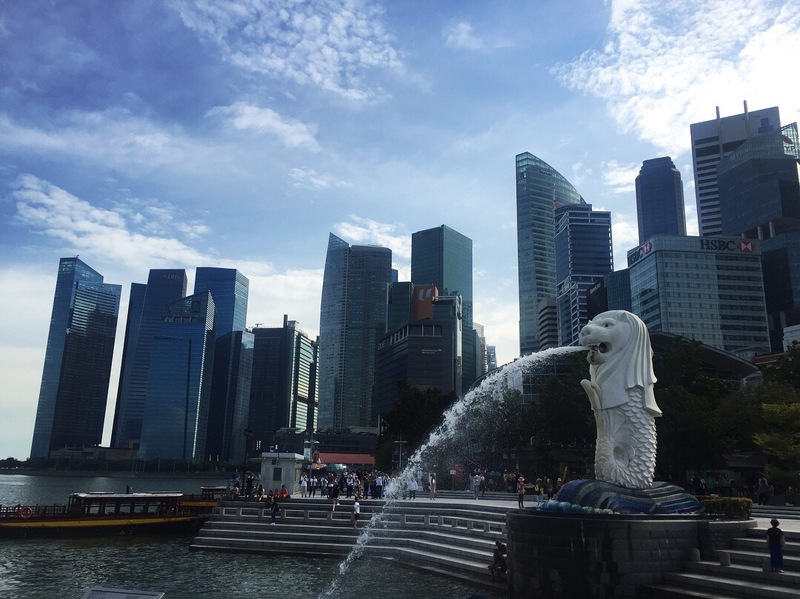 This is said to depict Singapores proud, strong culture (in the form of the lion) and its fishing history roots (in the form of the fish). The water shoots out into the harbour and the courtyard was full of people cupping their hands to get a picture that looked like the water was going right into it. It was very funny to sit and watch it all as people attempted to get that shot with only them in the frame. We had dinner by the river in a hawker centre (street food court) called Gluttons Bay which was a really nice place to eat. It’s right on the bay so we had been worried that the food would be outside of our budget due to its location, but we both found some nice food that we could afford – mine in particular we both really liked. It was called murtabak and was a roti filled with vegetables served with a curry sauce. 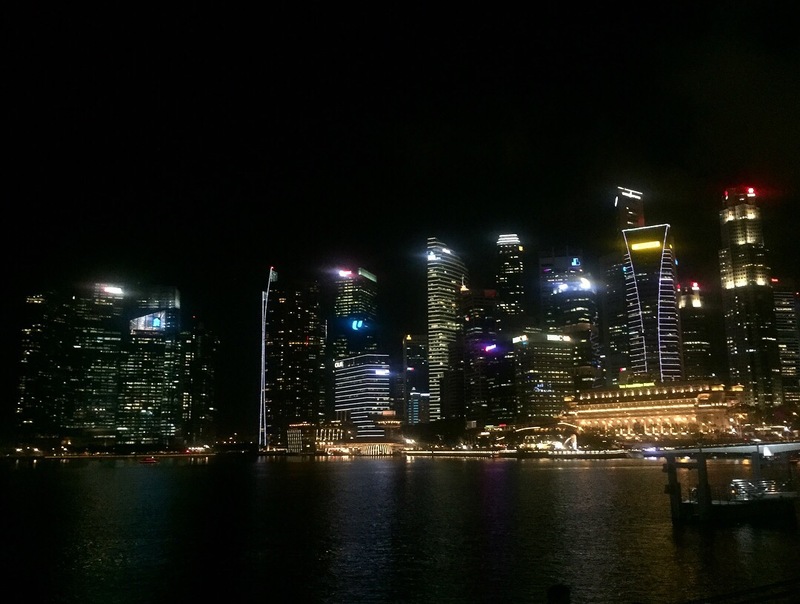 The Esplanade by the harbour holds free performances every night for anyone in Singapore to enjoy. 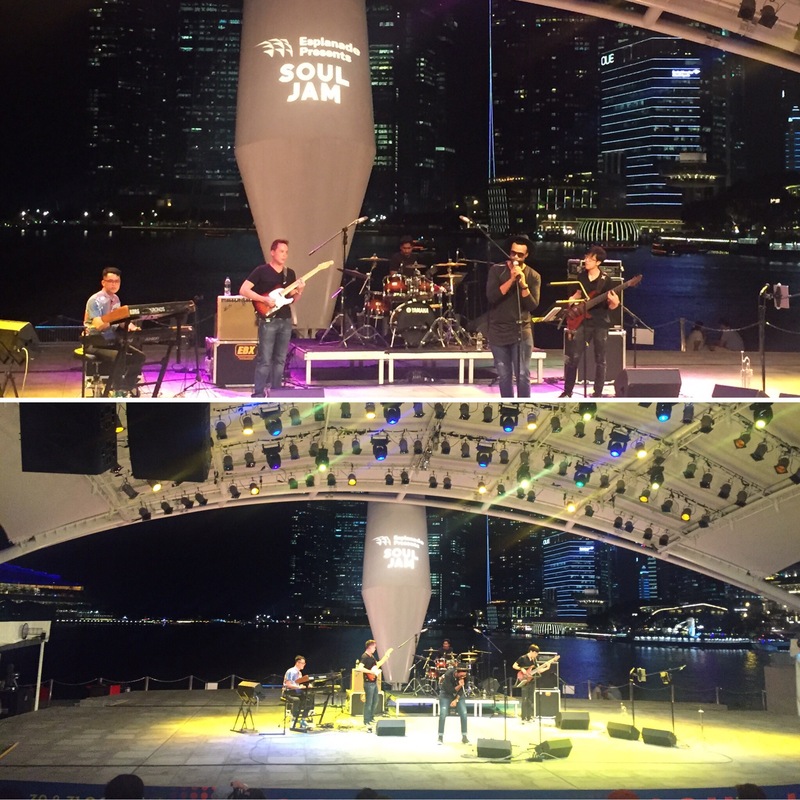 It’s in an open area venue which overlooks the river and we decided to go along to the one playing that night which was a band called Ground Up that was there as part of the Soul Jam event the Esplanade was running that month. They were from the US and did soul, funk and old r’n’b music – we hadn’t known what to expect from them but they were exceptional. The singer’s voice was incredible and they did covers from the likes of Stevie Wonder and James Brown. 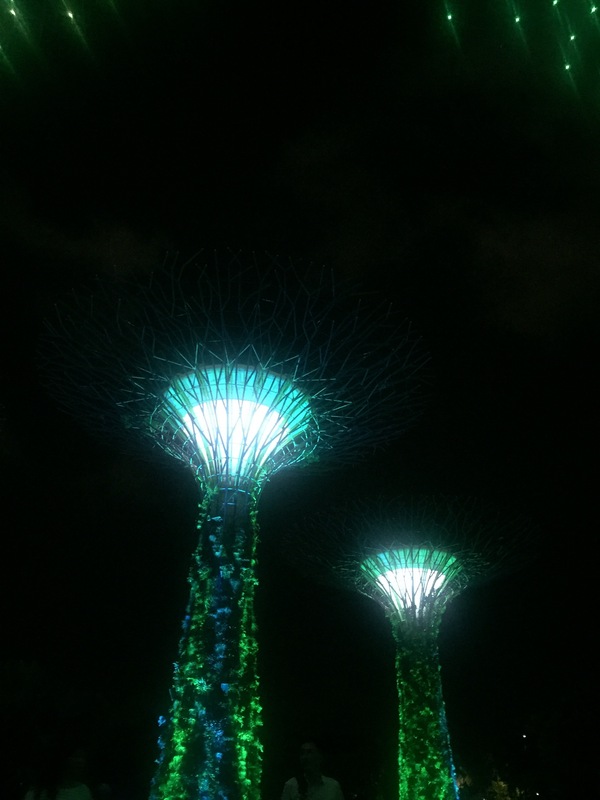 After the band had finished we raced over to the Gardens by the Bay that had a light show on a couple of times a night called Garden Rhapsody. 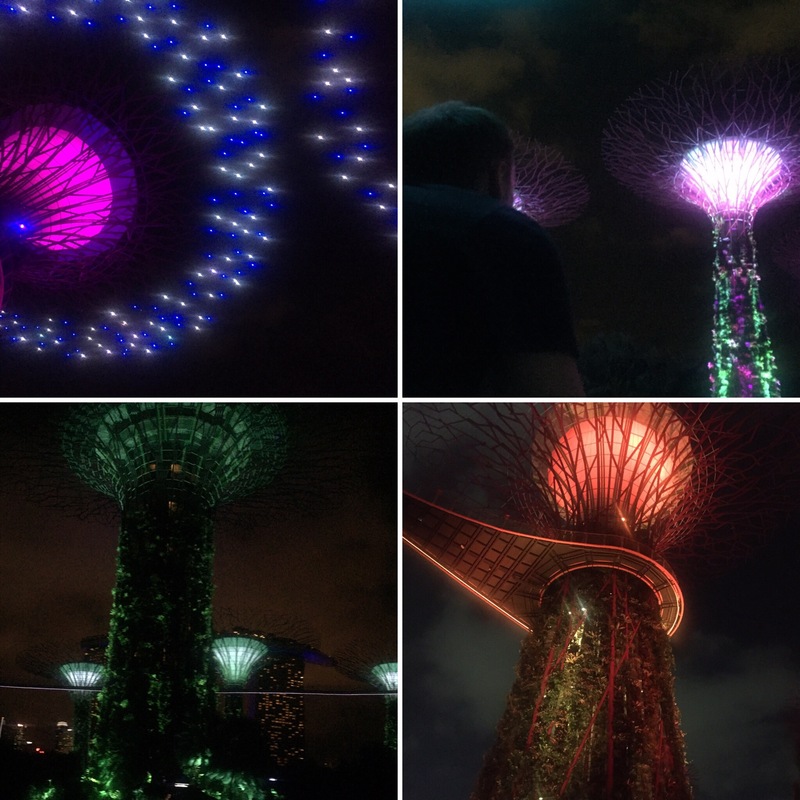 The Gardens by the Bay are a revolutionary urban garden that are focussed around these man made ‘trees’ that are enormous and light up at night. We lay on the floor and looked up at these amazing, lit up trees waiting for the show to begin. The show focussed on the Moon and played a range of songs that all had the moon as their central theme (Fly Me to the Moon, Moon River etc.) 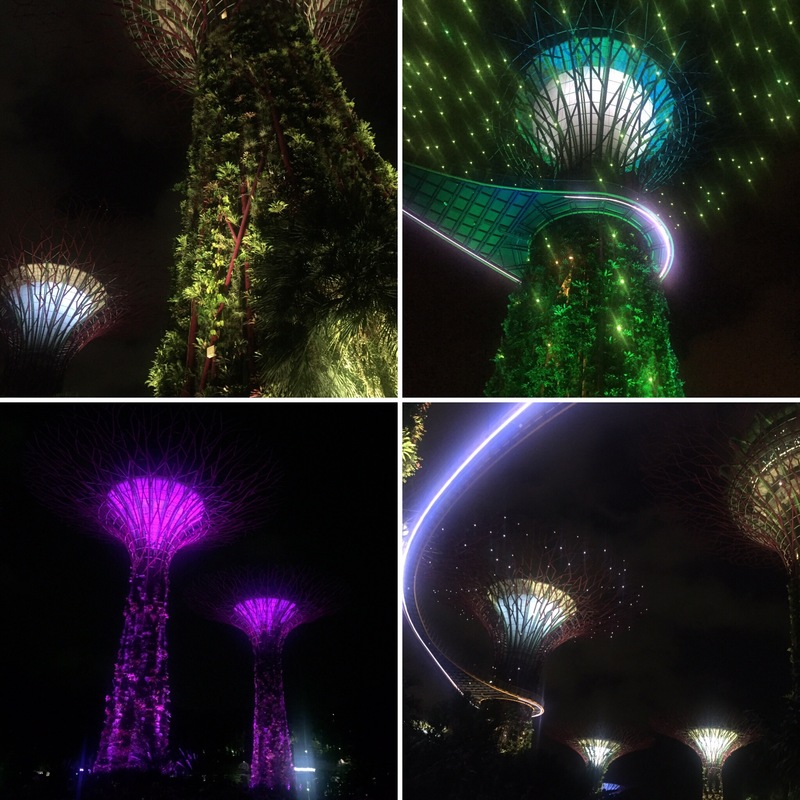 whilst a choreographed light show was played in the trees. It was great! The whole show was synced up perfectly and we really enjoyed it. 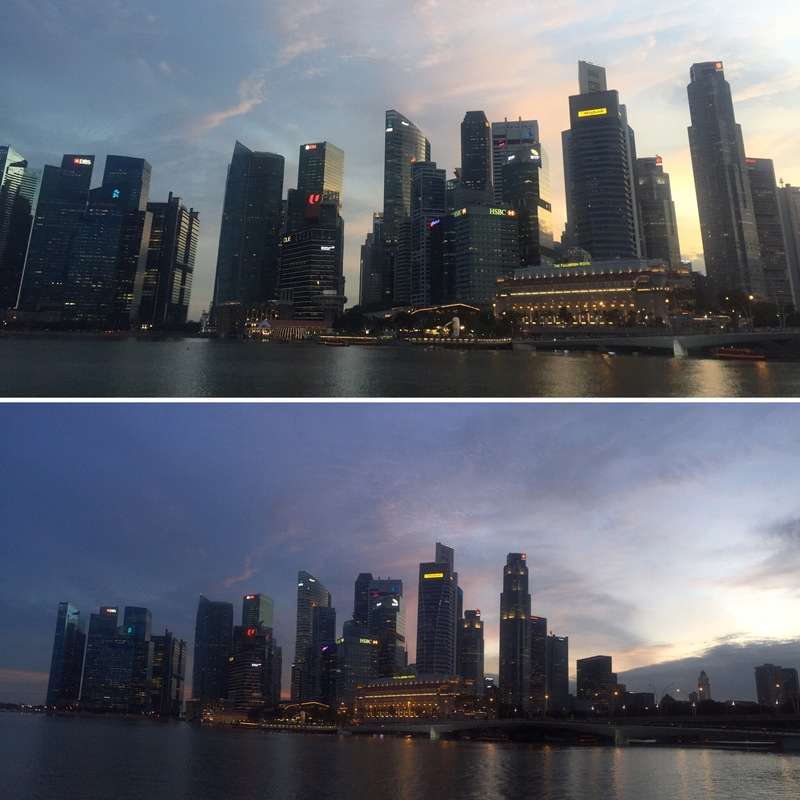 Our first full day in Singapore had been fantastic. 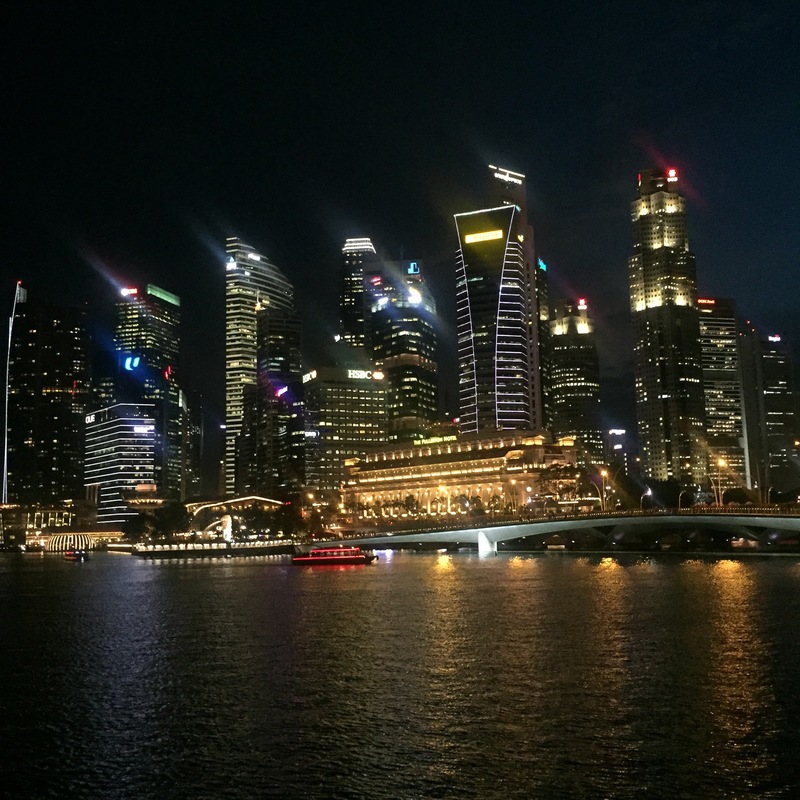 We were amazed by the number and quality of the free events that Singapore put on for the public every night and found the skyline (by day and by night) very impressive. We had taken an instant liking to the place and were looking forward to the next two days to explore some more.